Topiary's been unmasked. 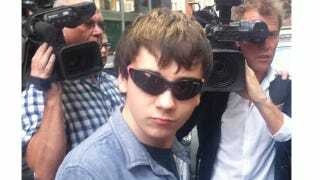 18-year-old Jake Davis, the alleged hacker chief behind LulzSec's many prominent internet assaults had his first day before a judge. And if the court's claims are true, the kid's pretty screwed. Neo shades notwithstanding, the police have some pretty damaging evidence against the teen, TNW reports: a purported cache of 750,000 personal information files and a draft of the fake Murdoch obit on his laptop. That's a lot of smoking guns. Upon leaving court, a demure-looking Davis was seen clutching a copy of Free Radicals, book on the history of subversive scientists. It's odd when we're forced to humanize these figures who'd hitherto been nothing but Twitter jabs and Pastebin dumps. He's a teen, looking like he just left a homecoming dance, who enjoys the history of science, and was behind one of the most prominent hacking campaigns in internet history. This Luke Sec character should team up with Louise and her boat. Update 2: Topiary's out on bail, and will return to court on the 30th.